The one of the world's greatest museums celebrates its 250th anniversary this year. Throughout its illustrious history, some of its most devoted servants have enjoyed a purr-fect view of the art collection. St. Petersburg’s Hermitage Museum is the treasure chest of Russia. Founded by Empress Catherine the Great, the teal palace on the bank of the Neva River contains one of the world’s most renowned art collections. But beneath the baroque grandeur lies a netherworld of heating ducts and storage rooms. Here, the walls are not covered with Rembrandt and Caravaggio, but cat photos. The cats’ story parallels that of the institution they have guarded for centuries, from splendour to poverty and back again. “It’s a true symbiosis of animal and human,” Maria Haltunen, assistant to the director and the cats’ press secretary, told RBTH. 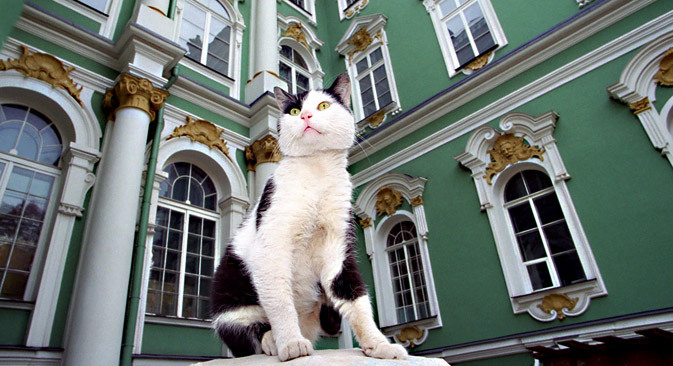 Cats have resided in the Winter Palace since the time of Empress Elizaveta Petrovna. In 1747, she issued a decree arranging for a chauffeur to bring “house cats suitable for catching” to the Winter Palace. A carriage full of Russian Blues was ferried posthaste from Kazan to the imperial residence in St. Petersburg. It was Elizaveta’s successor, Catherine the Great, who transformed the palace into one of the world’s greatest art institutions. “Very early on, she realised that [art] was a status symbol among the rulers of Europe,” said Geraldine Norman, author of “The Hermitage: Biography of a Great Museum” and advisor to the Hermitage’s director. In 1917, the October Revolution drove Tsar Nicholas II from the Winter Palace. According to Haltunen, the last Romanov rulers had a soft spot for animals, owning several family dogs and cats. While the dogs were shot alongside their owners, the cats were left behind at the palace, escaping their fate. The cats sustained their keepers by being eaten, marking the only time in the Hermitage’s history when they have been absent from the museum. After the war, the Hermitage recruited new cats from cities such as Novgorod and Pskov. As the country stabilised, the museum’s growing cat population paralleled the expansion of its displays. After Stalin’s death, the museum once again showed post-Impressionist and modernist canvases. In the early 1990s, the collapse of the Soviet Union left the Hermitage destitute. In the documentary “Hermitage Revealed” (see box), museum director Mikhail Piotrovsky recalls that there wasn’t even enough money to make repairs to the roof. In 1995, shortly after she began working at the museum, Haltunen walked down to the basement and was shocked to see dozens of cats staring back at her. The cats, like their home, were in dire straights, hungry and neglected. Haltunen and a friend began bringing porridge down from the cafeteria to feed them. They started a “Ruble for a Cat” campaign to raise money for food and medical treatment, and won Piotrovsky’s support to devote an area of the basement to the cats’ care and keeping. Today, it is full of scratching posts, food bowls and blankets placed on top of the heating pipes, where the cats cluster in winter. Though the cats no longer roam the halls as they did in Catherine’s day, the more sociable among them venture into the courtyards or down to the riverbank, pausing to scratch their claws on the entrance gate. Today, they have their own “passports” and boast a dedicated legion of volunteers and veterinarians, as well as an annual holiday in their honour, when visitors line up for the chance to meet (and adopt) them. Now, they are less hunters than cultural ambassadors — or “spoiled house cats,” as Haltunen jokes — but their presence still deters mice. They remain a part of the Hermitage's history, no less essential than its Monet paintings or its ancient gold, or the splendid halls of the Winter Palace. When filmmaker Margy Kinmouth set out to make a documentary on the Hermitage, she didn’t want just to show its art. “I wanted to go behind the scenes and show what really happened after the revolution,” she told RBTH. “Hermitage Revealed” marks the first time that a foreign director has been allowed to film inside the museum. Kinmouth came at the invitation of director Mikhail Piotrovsky and was granted complete access to the staff, exhibitions and vaults. “The storage areas are absolutely full of wonderful surprises, mysteries, objects that the public just don’t see,” she said. Among her favourite discoveries was an enamel imperial bathroom piled with treasures.